For many Japanese, the Hôtel de Mikuni sits at the pin­nacle of French cooking in Tokyo, revered for its adher­ence to the classics and particularly appreciated because it has not dabbled in the kind of experimental cook­ing that is so in vogue these days. 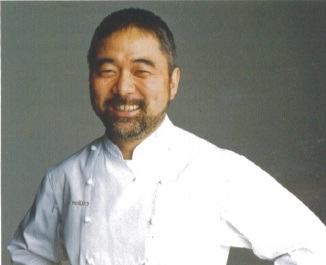 It’s run by star chef and marketer par excellence Kiyomi Mikuni, who spent eight years training with some of France’s greats (includ­ing Jean Troisgrois and Alain Chapel) before returning to Japan and opening his own restaurant in 1985. The Hôtel de Mikuni operates out of a charming old house, with a new modern annex attached, in a leafy residential neighborhood just a short stroll from the Akasaka Palace. My husband and I arrived for din­ner one evening and the main dining room was full, so we were ushered to the annex via the kitchen, which is apparently routine for annex guests who enter through the main house door. The kitchen was busy but immaculate, and rows and rows of creamy sea urchins peeking out from shiny, spiky black shells, were already laid out on the giant stainless steel counter like soldiers at a parade. Meanwhile, the annex itself is modern, comfortable and genteel, with white and beige decor and large stimulating murals by Hisao Domoto, a friend of the chef’s. One with orange squares looked like the color had run over, while another had intriguing green circles and splatterings of extra paint. Feeling hungry and wanting to taste a little bit of everything, we ordered the six-course dinner set (¥15,800) which began promisingly with a pre-appetizer: a sliver of onion quiche that was so soft and creamy it trembled in its pastry crust. A steady stream of food followed, but let me describe the ones that caught my attention. The foie gras came beautifully arranged with scallops and white asparagus in a long silver pan. Un­like the usual goose liver cooked in Sauterne or served with apple sauce, Mikuni’s version had a slight curry taste which proved refreshing and surprisingly enjoy­able. Next came a tender grilled isaki (striped pigfish) fillet topped with pink pepper and cresson, and resting on a bed of risotto made with green peas and Japanese dashi sauce — a perfect example of Mikuni’s ability to flawlessly combine Western and Japanese cooking. No one said anything to us, but we felt that Mikuni is at his best with duck. Our main course was a deli­cious duo of roasted dark duck meat in a sweet sauce that reeked of raisins, oranges and red wine, and a roll made of white duck meat swimming in a duck con­somme soup. Both were excellent, providing a good contrast in taste, color and texture. Then, just as we were about to pronounce our­selves extremely satisfied with our dinner, the maitre d’ wheeled in a formidable-looking wagon for the couple at the next table. On it was a proper carving board, an elegant heating contraption, assorted condiments and an entire roast duck with red berries strung right across its glazed body like a Christmas ornament. Before cut­ting the duck up, he elegantly held it up so that the aromatic juices fell onto a bowl to be used as part of the sauce later. Then he sliced two hefty pieces off and placed these on two large dinner plates already laden with crispy potatoes. The rest of the duck was returned to the kitchen, but later an array of little plates arrived bearing its remainders in various reincarnations. The glorious visual feast we witnessed, and the even more glorious aroma that wafted to our table as a result, prompted me to almost frantically hail a pass­ing waiter, literally take a menu from his hand and ask exactly what it was we were missing out on. It was le canard rôti “sang-de-boeuf” (¥15,800 for two persons). You know the end to this story. Of course we will be back at Hôtel de Mikuni — hopefully sometime soon — and this time for an actual taste of this particular whiff of heaven. The seasonal six-course dinner set (¥15,800) is a great (and reasonable) way to sample a variety and also enjoy Chef Mikuni’s talent for creating French food in a Japanese style. Within the à la carte menu, the truffle soup (La soupe de truffle, specialité Paul Bocuse / ¥9,500 ), the roasted duck (le canard roti “sang-de-boeuf”, ¥15,800 for two persons), and the roasted Bresse chicken seasoned with truffles (la poularde truffée pochee on rôtie; ¥26,300 for two per­sons) are highly recommended. Skip the thought of wines by the glass as we found none that did justice to the food. However, there is a superb 2002 Saint-Emilion Grand Cru called Chateau Bellevue (¥8,000 per bottle), which paired excellently with the duck. Hôtel de Mikuni is patronized mostly by Japanese and a sprinkling of foreigners who dine at restaurants worldwide associated with the Relais Gourmand association (www.relaisgourmands.com). Tokyo’s French community also come here to celebrate special occasions. 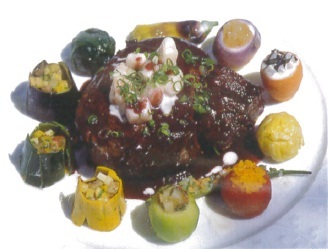 A full-course dinner and drinks for two will cost approximately ¥50,000. No one in particular. All you need is a confirmed reservation. Call in advance. Good luck.